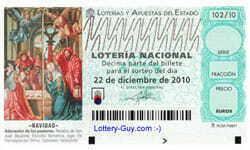 I am a ugandan and tried El Gordo lottery three years ago but could not see any price. I would like to know if El Gordo is only for the locals in spain or if international players are allowed. Thanks. I’d like to know also. I have conflicting information about whether anyone outside of Spain can play. On one site it says anyone offering tickets to international players is a scammer! Sure. For players outside of Spain you have 2 options. You can either buy tickets online using one of the online ticket buying services. Or you can play in a syndicate which will take care of buying tickets and claiming prizes for you – and give you a better chance of winning to boot. This is the way I play the Christmas El Gordo as it’s better value for money. These are the people I use. Thanks! I wish I’d found you sooner.